Two qualities define the Nile as the ultimate river. First, it is the world’s longest river. From the source in Rwanda to the end at the Mediterranean Sea, it travels 6650 kilometres (4130 miles). Second, the Nile is a truly cosmopolitan water. Its source lies in tropical Africa, its most important tributary – the Blue Nile – originates in the Ethiopian highlands. Its longest stage – through Sudan and Egypt – is characterised by Arab influences. Travelling through a sea of sand, this river gives life. It passes Africa’s largest city – Cairo – and ends only a few hundred kilometres away from Europe, in the Mediterranean Sea. In the Rwenzori mountains, the wide source area of the Nile contains a spectacular feature. One snow-covered peak reaches 5000 metres (5500 yards) above sea level. Underneath its glacier, a fairy-tale forest expands, covered with Giant Lobelia and Aster plants. In this damp and cold world, the stunningly beautiful Lobelia Scarlet-tufted Malachite Sunbird lives its life. The males defend their plants, until the female birds arrive from warmer climes for the mating season. Forests at lower altitudes provide a paradise for reptiles like the insect-hunting chameleons unique to these mountains. The source furthest away from the Nile delta lies in Rwanda’s Nyungwe National Park. Thirteen species of primates live there, most notably the truly acrobatic Angola Colobus. From Rwanda, the Nile feeds Lake Victoria, famed for its colourful cichlids and its emerald green island, and notorious for its environmental problems. Magic moments: Billions of lake flies dance their mating ritual, hovering high above the lake like smoke from distant fires. 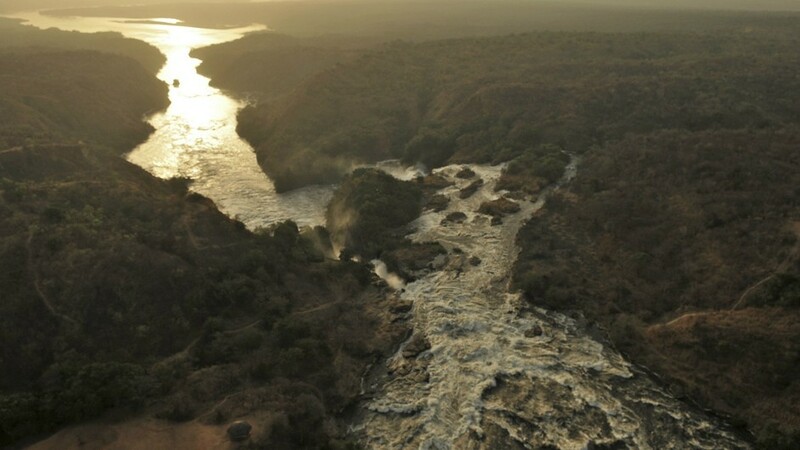 A few hundred kilometres after leaving Lake Victoria, the Nile plunges noisily over massive waterfalls and into the new territory of Murchison Falls National Park. Thousands of hippos enjoy the water. In the afternoons, elephant herds leave the savannah to drink and bathe. At the river banks, you can witness a curious partnership. Female crocodiles and tiny birds defend their eggs together against a thief, the Nile Monitor. The Nile’s greatest wilderness is situated in the crisis-torn South Sudan, where the river turns into the Sudd, Africa’s largest swamp. This is the perfect habitat for a fantastic variety of bird species, among them the extremely rare Shoebill. Giants, too, can make a living here. Some four hundred elephants live among the papyrus. With the help of a plucky helicopter pilot from Kenya, the film team succeeded in recording the great antelope migration of the South Sudan for the first time. With the onset of the rainy season, over a million Mongalla gazelles and White-eared kob leave the swamps for the savannah east of the Nile. The Blue Nile is the White Nile’s most important tributary. Its source springs from the Ethiopian highlands, one of the most beautiful landscapes on the planet. The rocks and canyons of the Simien mountains are a vulture’s paradise and home to some rare animal species. The Walia Ibex and the fantastic Gelada are unique to the land of the Blue Nile. There used to be a Yellow Nile, too, originating in the Chad. This tributary to the Nile dried out some 6000 years ago, but at its source, there is still water and even a tiny lake, sustaining a species of crocodile not found elsewhere in Africa. The last stage of the Nile leads through Egypt, past temples and tombs. Today, more than 80 million people live in the delta, among them two brothers who earn a living by hunting the Egyptian cobra. Finally, the Nile loses its way in a vast delta streaked by countless channels and ends in the Mediterranean Sea. A comprehensive view into what’s been going on behind cameras can be found in our article: ‘Behind the Scenes: Nile – The ultimate River’.